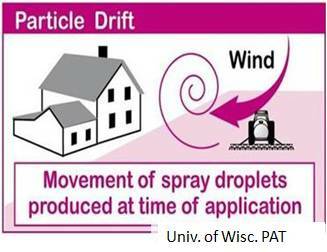 Particle or droplet drift occurs during or soon after the application. ‘Particle’ means the active ingredient of a pesticide as a liquid (spray droplet), granule, pellet, dust, fumigant, etc. Small droplets are more likely to drift than larger droplets. 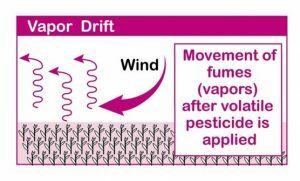 A number of factors influence droplet size, including formulation, nozzle type, sprayer pressure and weather conditions. Particle, droplet and vapor drift can cause aesthetic as well as economic injury. The oak, on the left will grow past the damage. 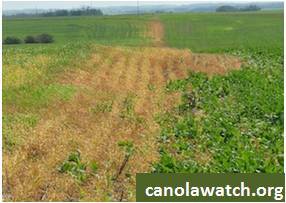 The drift-damaged canola, on the right, will not. 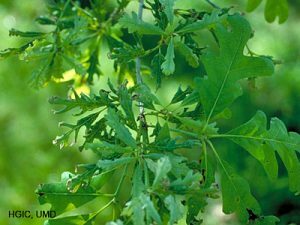 Is Herbicide Resistance to Blame? Is Insecticide Resistance to Blame? What Can You Do About Resistant Insects? Is Fungicide Resistance to Blame? What respirator do I need?